Delicious Reads: Interview with Teri Harman and Review for "Blood Moon"
Interview with Teri Harman and Review for "Blood Moon"
SUMMARY: Willa and Simon have grown up feeling out of touch with society because of a magic housed deep inside them - Willa's sees ghosts and dreams future events and Simon feels others emotions and can heal with a touch. It isn't until a chance meeting in Willa's hometown, Twelve Acres, that the two teens find out that they are actually witches. As an unexplained and powerful magic pull them together, they have to choose to put away their simple lives and dreams to become part of true Light Covenant, joined together forever with 10 other witches. If they don't, the Dark witches may send Twelve Acres and the rest of their world back into the dark ages. REVIEW: We were lucky enough to get the author, Teri Harman, to come IN PERSON to our magical night! Nearly everyone dressed in their witchiest attire, including Teri, while we ate our magically-inspired food. Since Teri was there, we spent a bulk of the evening getting to know her and getting behind the scenes info on all things Blood Moon (see Q&A below). Check out and download the fun PowerPoint created by our moderator, Kelly HERE. 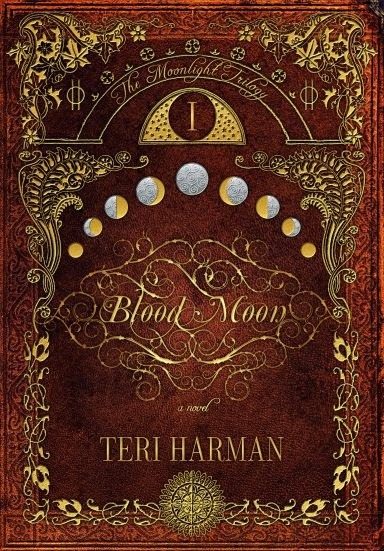 As we talked with Teri, we discovered that many of the questions we had with Blood Moon will be answered in Book #2: Black Moon. We all want to know what is going to happen with poor Simon. We also want to know more about Amelia and Solace. 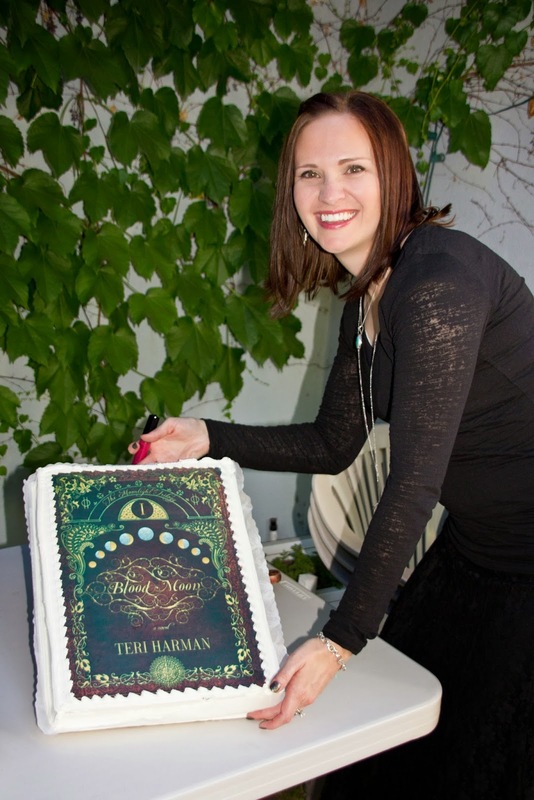 Storm Moon will be Book #3 – which Teri admitted she has yet to write. We all tried to give her ideas, though :). She also admitted she is not an outliner when she writes. She is a discovery writer, meaning she the story is created as she writes. We discussed soul mates and the relationship between Willa and Simon. We thought it was beautiful to read about their instant connection. Teri compared Willa and Simon's connection to how she met her husband at a young age and eventually started dating him. Delicious Reader, Karen, admitted she felt the same way about her husband too. We wondered about the reader response Teri has gotten about starting the book straight off with Simon and Willa. Teri wanted everyone to understand right at the start that Simon and Willa have an unbreakable bond, that may be challenged, but it is solid. She wanted people to get that this story wouldn't be about some cliche love triangle, but that it would be about the magical story of all the characters. Teri told us that she wrote Blood Moon not thinking about readers, but wrote the story that she saw. When she started Black Moon, she started to think about readers and after 45,000 words she had to throw it all out and start the story over because she was trying to do something that wasn't right. She quoted Stephen King, “Write with the door closed. Re-write with the door open.” So she wrote the first draft without paying attention to anyone else and not reading people's reviews of her book. Teri met real witches before Blood Moon came out. She went to Salem and talked with some real witches that truly believe their magic comes from the earth and you can manipulate the earth to make things happen. She compared spells to the Christian version of prayer. 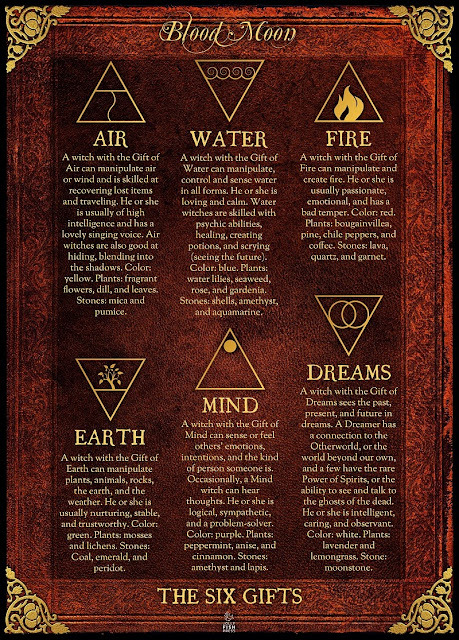 Each of us took the “Which Witch Are You” quiz to find out which type of magic we would have. 2. Have you always enjoyed writing? Yes! I've always loved writing even as a child. My first story was about a cow, which I dictated to my mom and she typed on her electric typewriter when I was four or five. 3. Where did your inspiration for Blood Moon come from? A Halloween party. Every year I host a witch themed Halloween party for the women in my family. In 2010, I found an incredible location - a 100 year old school house out in the middle of nowhere. The Camp Floyd School House was so perfect I needed a party to match. I started reading up on witches and magic to get ideas for the party, but was so fascinated by what I read that it soon became inspiration for a novel. 4. 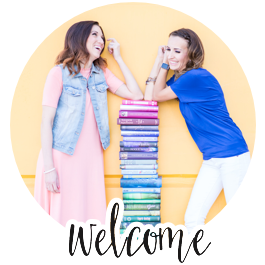 What was your publishing experience like? The first book I tried to publish didn't work out, but I was able to get an agent for Blood Moon. A year later, we still hadn't found a publisher, but my brother was at a BYU conference and saw Jolly Fish Press. We sent my stuff off and they agreed to publish. All together it took me 6 years and over 100 rejections before I saw my first novel published. It's chaos! But it's also great. I have to be disciplined, but also flexible to get everything done that I need to everyday. I love being at home for my kids, but am so glad I have my own pursuits as well - it keeps me sane. And luckily I have wonderful kids and an extremely helpful husband. This book is very dear to my heart. I wrote it while BLOOD MOON was on submission and I was wondering if my dream would ever be realized. This is Saffron's story. Saffron is a painting - a girl in a painting who is alive. She wants nothing more than to escape her prison of oil and canvas to live a normal life. A normal life with the man she loves, Emmett Charles. The book is set in the late 1890's in Boston and is part literary fiction, part magic realism, part romance. I can't wait for reader's to read it! 7. What other hobbies or interests do you have? I am addicted to stories. I read a LOT! I also love watching TV series and movies. I enjoy yoga, dancing and biking. We also love to travel and be in the great outdoors. And when the mood strikes me, I love to cook. 8. What are your favorite movies/TV Shows? Call the Midwife (Netflix), Walking Dead, Sherlock, Downton Abbey, North and South (BBC), Wuthering Heights (BBC with Tom Hardy), The Big Bang Theory. The best witch movies I've seen are Practical Magic and Hocus Pocus. There are so many non-witch movies--its so hard to choose. An oldie but goodie is Sense and Sensibility (Emma Thompson one), The River Wild, The Decoy Bride, Love Actually, Willy Wonka and the Chocolate Factory, Edward Scissorhands, I'm also a sucker for old movies and musicals. I'm kind of a geek too so we love Doctor Who, Battlestar Galatica, and some of my favorite movies are the old Star Trek movies. I grew up on them, but I'm sure people who watch them now are saying, "What is wrong with you?!" I watched The Next Generation and probably have seen every episode at least five times. My favorite witch writer is Paula Brackston. She actually has two books out right now The Witch's Daughter and The Winter Witch. The Winter Witch just came out this spring. 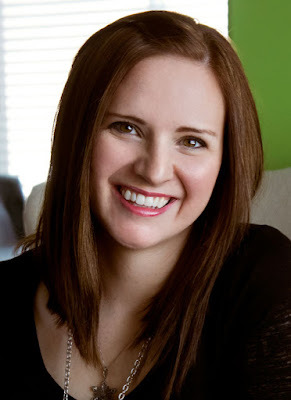 Her books have natural magic--they are like historical fiction/supernatural thriller. I hope she comes out with lots of them. 10. What books have you enjoyed that you think would make a good book club book? We have a book club and we've read The Thirteenth Tale, The Book Thief, Big in Japan, Eleanor & Park (watch out for swearing and sexual content), The Snow Child, The Light Between Oceans. 11. Tell us about your book launch at The King's English. That was one of the surreal, dream days because I go to the King's English all the time. It's my favorite book store. Every time I've stepped in there or gone to an author event, there was always in the back of my head, "I really want it to be me! Why isn't it me yet?" So that day was surreal and perfect. The King's English had a cake made with the book cover image. I didn't even know they were going to do that. 12. Which Witch gift would you choose? I would have to say Willa's gift because a lot of the scenes in the book were inspired by my own dreams. That's why I gave her that gift. That's where it all began. The hand reaching out - that was a dream I had. I saw that hand. Also, the part where Willa is running through the forest and the sky shatters and falls. That was a dream. When I was thinking of what her magical power would be I thought, "Let's make her a dreamer." She's not me, but that gift is what I would want. Wonderful and thorough review Robin! It was such a fun evening having Teri there.